SoftPlanet makes it possible for everyone to get free JoyToKey download directly from our servers. There is no registration needed for downloading. You have various ways to play games, since some of them are played with a keyboard, others with a mouse and third with a joystick. In this way some people get attached to their joystick and want to use it for other functions, than just playing. 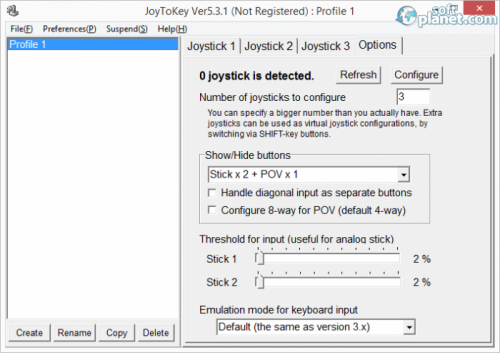 JoyToKey 5.6 can simulate that you use a keyboard and a mouse, while at the same time you do everything with your joystick. The app converts the pressing of the joystick buttons and the movement of the stick into keyboard button pressing and mouse movements. In this way you can make your joystick into the only peripheral that you may need. Using this program is very easy, because with it you can create different profiles for different games, programs or any other functions which you may want to use your joystick for. This way you can create different combinations, according to the apps that you use. After you select a profile you can set any key on the keyboard that you want to use to respond to a button on your joystick. But if you have fewer keys on your joystick, which is the normal difference between a keyboard and a joystick, you can set one of the buttons to act like an activation key for another joystick, expanding in this way the usefulness of your joystick and also the program. 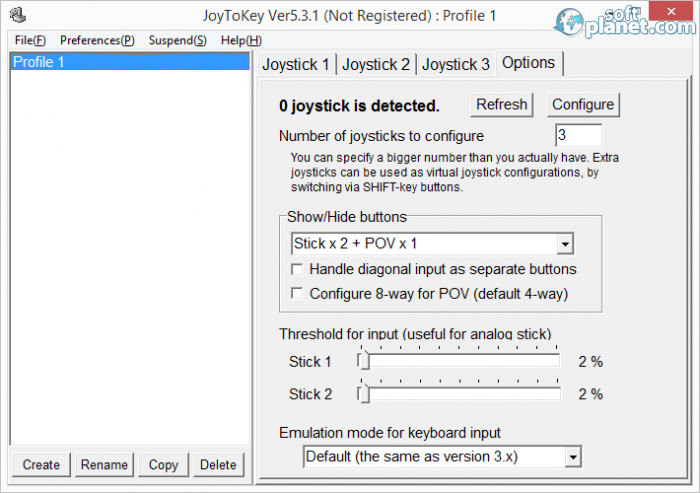 JoyToKey has probably the simplest interface out there. There are no graphics on the buttons or any visualization that tries to impress users. 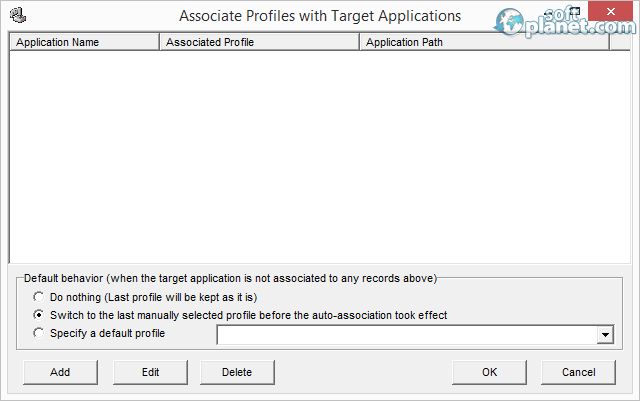 The main window contains the profiles and their list and below them you can create, rename, copy or delete them. The joysticks that you can adjust are to the left and you are able to set any number of joysticks that you want to use. From the options you can set which buttons of the joystick will activate the additional ones and also you can configure thresholds for the input. That function is particularly useful for the analog sticks. There are also some tabs on top of the main screen of the program, which allow additional settings for the app and the joysticks, but they are not so many, so the overall feeling of simplicity remains for the whole app. 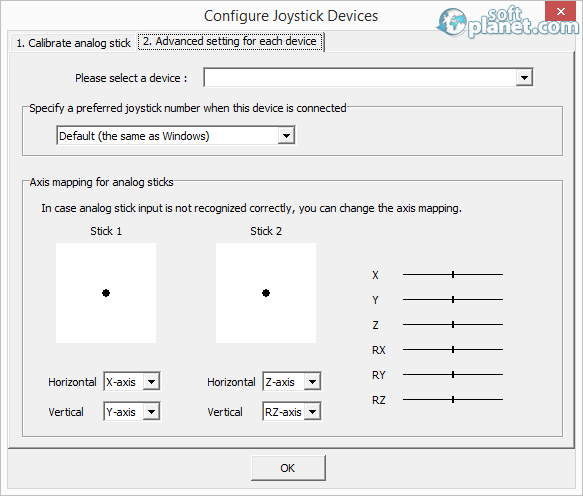 Before you start using the joysticks you can set them from Configure Joystick Devices. There you can calibrate the analog stick or set the Advanced settings for each device. This is also the place where you can set the sensitivity of different joysticks, adjusting their horizontal and vertical axes. If you need to suspend the functions of JoyToKey 5.6 for some time you can do it from the Suspend menu. It allows you to suspend auto-association of profiles with the applications or to suspend the processing of the joystick input. Overall the app lets you control your joystick in various ways and to set it up as you like it to be. 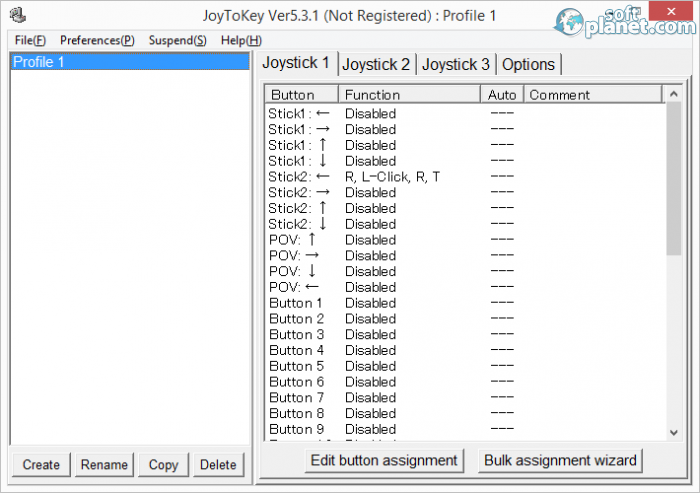 There are many reasons for which you can download JoyToKey, but the main one should be if you want to use your joystick for replacement of your keyboard and mouse. The app gives you the tools to do it and it offers that for free. But if you like it you can register it, as the only thing that you need to do is pay only USD 7.00 to developer JTK. Our security scan shows that JoyToKey is clean from viruses. The current version of JoyToKey has been scanned by our system, which contains 46 different anti-virus algorithms. That ensures that JoyToKey 5.6 is 100% safe for your computer.